After the release of major SSC Exam dates by the Commission, it is high time to wear an unwavering attitude to bring the best of your study session. SSC CGL, CPO and CHSL are big exams holding Quantitative Aptitude as a mandatory section which makes it a vital reason to practice continuously until the exam appears. ADDA247 with its tactful efforts boosts your preparation and let you get a heedful insight of your performance to crack the exam and is also impregnable to keep its record track of selection of aspirants in such competitive exams each and every year. Speaking of getting selection in such competitive exams, dealing with every single topic of exam’s major section excellently is a big factor to conquer and same goes with Algebra and Number System, undeniably important topics of Quantitative Aptitude.Yes students, being ignorant of the practice required to master these two important topics from the exam point of view can make you bite the dust! Considering every devoted SSC Exam aspirant’s desire to get an all-rounder book edition for SSC Exams 2018, The Cracker Practice Book for Algebra and Number System (In English Printed Edition) at just a decent price of Rs.249 is an another superior Book in SSC Exams Edition developed under the guidance of top-notch faculty of ADDA247 and Mathematics’ experts. Why should you buy The Cracker Practice Book for Algebra and Number System (In English Printed Edition)? Our latest Publication brings out a brilliant compilation of “1300+ Questions for SSC Exams 2018 ” in English Medium to enhance the quality of your practice not only for SSC Tier-1 but also for SSC Tier-2 Exams.This book edition assists you for SSC Exams viz. SSC CPO, SSC CGL and CHSL to outsmart your competitors. At just a decent price of 249, The Cracker Practice Book for Algebra and Number System is worth giving a try. 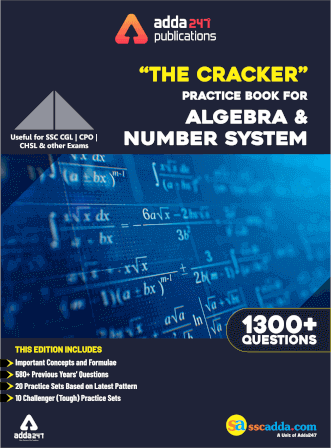 The Cracker Practice Book for Algebra and Number System is incorporated with efficient Practice Sets encompassing bunches of Questions based on latest exam followed by SSC in recent years pattern and hence prepare you to face real exam level difficulties to eradicate all your doubts and clears the concepts to an extensive level to its readers. This is the golden time to practice with a trustworthy book edition by ADDA247 instead of chopping and changing the various sources. With 850+ Current SSC Exam difficulty level Questions, The Cracker Practice Book For SSC Mensuration is your real companion to assist you when it comes to a holistic preparation in Quantitative Aptitude. 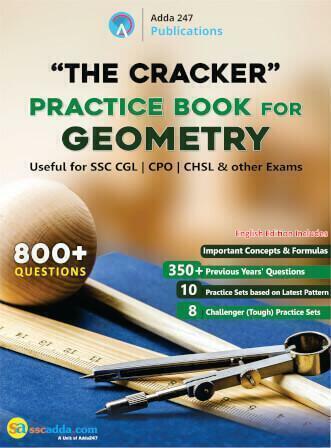 With 800+ Current SSC Exam difficulty level Questions, The Cracker Practice Book For SSC Geometry is your real companion to assist you when it comes to a holistic preparation in Quantitative Aptitude.